This recipe is a People’s staff favorite! It’s quick and easy to cook and if you make a double batch, you’ll have warm and satisfying leftovers to enjoy all week long. Heat the oil in a large, deep skillet over medium high heat. Add the shallots and saute them for 5-6 minutes or until they just begin to get golden. Add the butternut squash and grated ginger, stir to coat with the oil. Add the red curry paste, yellow curry powder and stir until all the butternut squash is nicely coated. Continue to cook the curry paste for 2-3 minutes or until it’s fragrant. Add the broth, coconut milk, Fysh sauce, and sugar. Let the sauce come to a simmer before covering. Lower the heat and allow the squash to cook all the way through, about 12-18 minutes. You’ll know it’s done when you can easily pierce the butternut squash with the tip of a knife. Stir in the baby spinach and allow it to wilt (if using kale, add it before the butternut squash becomes soft so that the kale has enough time to wilt). Serve with basmati rice topped with crushed nuts, cilantro, and lime wedges. Heat the oven to 400°. First, roast the beets! Cut off the beet greens down to about an inch. Wrap the whole beets in a foil pouch or use a covered baking dish, which will help the beets steam. Bake the beets for 50-60 minutes, or until they are tender when poked with a knife. Remove the beets from their cooking receptacle and cool. Peel the beets and then, slice them into rounds about ¼ inch thick. While the beets are roasting, prepare the oranges. Carefully cut away the peels using a sharp knife, trying to remove as much of the white pith as you can. Then slice the oranges into rounds around the middle (so that each slice has a piece of every natural orange segment). Aim for the slices to be about ¼ inch thick. Then make the vinaigrette. Put the lemon zest, lemon juice, vinegar, and olive oil in a small bowl. Smash the garlic clove with the heel of your hand or a knife, remove the peel, and add it to the vinaigrette. Season with salt and pepper and shake to combine. Let this mixture hang out for at least 10 minutes, and remove the garlic clove before using. Refrigerate any leftover dressing and use on green salads, roasted or steamed vegetables, and any other salads your mind dreams up. When the beets and oranges are sliced and your vinaigrette is made, thinly slice the avocados. At this point, you can throw all of the components into a bowl and toss them with the dressing. This salad looks really lovely on a platter, too, in which case you can artfully lay out the citrus, then the beets, then the avocados, then anything else you might be adding, and then drizzle the dressing over top. Enjoy! This is a variation of Okonomiyaki, which are Japanese cabbage pancakes. This recipe is a great template – you can use whatever bits and pieces of vegetables you have on hand and make a great pancake. From shredded kohlrabi or carrots to green onions, bok choy leaves and broccoli, most any combination will work. Makes about 15-18 4-5-inch pancakes. In a large bowl whisk the eggs with the flour, salt, sesame oil and soy sauce into a fairly smooth, thin batter. There may well be a few lumps but they will work themselves out so don’t worry about them. Add all the vegetables and herbs and mix well. Taste for seasoning. You’d be surprised how much salt they need. Heat 1 ½ tablespoons of oil in the largest skillet you have over medium high heat. I make my pancakes about 5 inches in diameter but make them as big or small as you like. You can one very large one and then cut it into wedges. Cook about 3 minutes on either side until nicely browned and crisp. Proceed with the remaining batter. You can keep them warm in a 250 degree oven. Mix together the mayonnaise, Sriracha and soy sauce and serve the pancakes topped with the sauce. Get 40% Off a Subscription to Cook with What You Have! What to do with the vegetables in the fridge? Short on time but still want healthful meals? And how to be well-stocked so that cooking is more fun and frankly, realistic. People’s is partnering with Cook With What You Have, a subscription-based, online seasonal recipe collection created by People's Member-Owner Katherine Deumling. Katherine empowers you to cook freely and build creativity and confidence with every dish. Cook With What You Have is providing a discounted subscription to the Recipe Collection for People’s Members/Owners & Customers for $29/year, or $2.99/month (40% off retail). Use discount code PEOPLES to subscribe at www.cookwithwhatyouhave.com, if you’re interested. Katherine will also be teaching classes at the Co-op in the winter, so keep an eye out. Preserved lemons are a classic component of North African cuisines, but are a flavor powerhouse adaptable to all kinds of foods. Try them in soups, salad dressing, pasta dishes, with roasted veggies, and anything else where their pleasant tang might be welcome. You can also add warm spices like whole cinnamon, cloves, or cardamom when you add the peppercorns and bay leaves if you’d like! Scrub three to five organic lemons, enough to fit snugly in a roughly pint-sized jar with a tight-fitting lid. Slice each lemon “vertically” from the top to about half an inch from the bottom, nearly cutting them into quarters but leaving the pieces attached at one end. Rub kosher salt over the cut surfaces and then reshape the fruit. Cover the bottom of the jar with more kosher salt. Fit all the cut lemons in, breaking them apart if necessary. Sprinkle salt on each layer. Press the lemons down to release their juices. Add the peppercorns and bay leaves to the jar. Squeeze additional prepared lemons into the jar if you can fit them. Close the jar and let ripen at a cool room temperature, shaking the jar every day for 3 to 4 weeks, or until the rinds are tender to the bite. Then store the jar in the refrigerator. To use, remove a piece of lemon and rinse it (you can add more fresh lemons to the brine as you use them up.). Scrape the white pulp from the rind and mince the rind. Add the rind at the very end of cooking, or use it raw. The pulp can be added to a simmering pot of soup or stew. Sort the black-eyed peas, removing any stones or debris. Rinse the beans, and then soak them overnight or for 8 hours. Drain the beans, then put them in a pot and cover with water. Bring up to a boil, then turn down to a simmer and cook for 30-60 minutes, or until the beans are soft. While the beans are simmering, cook your brown rice: combine the rice with 1 cup of water in a saucepan. Bring it up to a boil and then reduce the heat to low and cover the pan. Cook for 45 minutes or until tender. Alternatively, cook the rice in your rice cooker according to the manufacturer’s instructions. When the beans begin to soften, season them with salt. When they’re done cooking, drain them and set aside. Heat a large nonstick skillet over mediumhigh heat. Add oil; swirl to coat. Add onion, bell pepper, and celery and sauté for 7 minutes. Add garlic and cook 30 seconds. Add rice, stirring to coat. Add the stock, ½ cup water, salt, paprika, thyme, black pepper, and ground red pepper, and bring to a boil. Cover, reduce heat, and simmer for 10 minutes. Add the black-eyed peas and cook uncovered for 2 minutes or until thoroughly heated, stirring occasionally. Sprinkle with tomato and green onions. This is so delicious and you can use either parsley, cilantro, or both, which is maybe my favorite version. Just make sure you toast the pumpkin seeds first. It doesn’t have any cheese in it, but is rich from the large amount of pumpkin seeds. I use a food processor for this but if you don’t have one you can make a slightly less uniform version by finely and mincing/chopping everything by hand as finely as you can. You can use this pesto as a spread on crostini or sandwiches, or stir it into scrambled eggs. It’s delicious mixed with either plain yogurt and/or mayonnaise for a dip or sauce for roasted vegetables, meats or fish. You can dilute it with water, cream, more oil and/or lemon juice) for a dressing for grain or bean salads. And of course you can serve it with pasta like basil pesto. Be sure to thin it with a bit of hot, starchy pasta cooking water in that case. Toast pumpkin seeds in a dry skillet over medium heat. Shake the pan frequently to ensure even toasting. The seeds begin popping when they’re just about done. It will take about 5-7 minutes for them to turn a bit golden and pop. Be careful not to burn them and put them in a bowl cool completely before using in the pesto. If you leave them in the pan to cool the may get too dark. Process the seeds and garlic in a food processor until quite fine. Add herbs and a few pinches salt and process again until its very finely chopped. Add oil and pulse a few times and taste. Adjust for salt and add just a touch of lemon juice. You don’t want a pronounced lemon flavor, but just a little to brighten everything up. Use as a spread or mix with mayonnaise or yogurt (see headnote) for a dip or dilute for a dressing/sauce. Do you want to love vegetables more? Do you want to waste less? Do you want to be able to substitute ingredients with ease to suit your taste and what you have on hand? People’s is partnering with Cook With What You Have, a subscription-based, online seasonal recipe collection created by People's Member-Owner Katherine Deumling. Katherine empowers you to cook freely and build creativity and confidence with every dish. Cook With What You Have is providing a discounted subscription to the Recipe Collection for People’s Member-Owners & Customers for $29/year, or $2.99/month (40% off retail). Use discount code PEOPLES to subscribe at www.cookwithwhatyouhave.com, if you’re interested. Katherine will also be teaching classes at the Co-op in the winter, so keep an eye out. Quick and fun to make, look at and eat. If the “steaks” don’t hold together, don’t worry. The pieces will all be delicious. Trim any leaves (and reserve to add to stir fries, soups, etc.) from the cauliflower and cut off the most fibrous base of the stem/core. Don’t remove the core though. Most of it will get deliciously tender and you need it to keep the “steaks” together. Set the cauliflower upright on a cutting board. Cut the cauliflower in half and then working out to the edges, cut each half into about 1-inch thick slices. Some florets will fall off and that’s fine. Fit them around the edge of the steaks in the pan. You’ll probably end up with some steaks the full 1/2 size of the cauliflower and some smaller steaks. Heat a couple of tablespoon olive oil in a large, heavy skillet over medium-high heat. Place as many steaks as you can fit in one layer in the pan. Sprinkle generously with salt. Cook, covered, for about 3-4 minutes on each side, salting the other side too, until deeply browned and just tender pierced with the tip of a knife. Repeat with remaining cauliflower. Mix the mayonnaise, mustard and parsley in a small bowl. Serve the steaks hot with the dijonnaise. Sauté the diced yellow onion in the ghee or coconut oil in a medium size pot over medium heat until the onion is translucent. Add the sweet curry powder and coconut flakes and sauté lightly to evenly toast spices, for about 30 seconds. Keep an eye on the pot, stirring constantly to make sure nothing burns! Turn heat down from medium to low if needed. Add rice and water to the pot and stir for a few seconds to prevent rice from sticking to the bottom of the pot. Add salt to taste. I like about 3 tablespoons. Cover the pot with a lid and let simmer on medium-low heat for about 30 minutes. Stir the rice about every 10 minutes to ensure even cooking. Taste occasionally for done-ness. Once the rice is fully cooked, remove from heat and serve with a garnish of pomegranate seeds and cilantro. You should have about 4 generous servings. Even with its few references to “man salads” (what does that mean? can I not dig a hearty salad? ), Joshua McFadden’s Six Seasons was far and away my favorite cookbook of 2017. I have been reaching for it constantly all summer, and can’t wait to tuck into some of the fall and winter recipes. This dish offers a totally new-to-me way enjoy squash – raw! With brown butter, pecans, and currants, it still feels squarely wintry. Put the currants in a little bowl and add the vinegar. Let them soak for 30 minutes. Trim the scallions, including about 2 inches worth on the green part. Thinly slice them (at an angle if you are feeling fancy) and soak them in ice water for 20 minutes or so, then drain them thoroughly. Peel and seed the squash or pumpkin. Use a vegetable peeler to slice off thin ribbons of squash. If you run into hard bits, just use a knife to slice them as thinly as you can! The pieces don’t need to be uniform – just nice to eat. Put the squash in a large bowl and add the currants with their vinegar, the scallions, the chile flakes, and a generous sprinkle of salt and pepper. Toss to combine, and taste. Adjust the seasoning if it’s not quite right. Brown the butter! Melt it in a small saucepan over medium heat. Keep cooking the butter, swirling the pan every few seconds. The milk solids in the bottom of the pan will turn a deep golden brown and start to smell nice and nutty, which will take about 3 to 5 minutes, depending on the size of the pan. This technique should also work for vegan butter, but you could also gently heat an equal amount of olive oil and add a bit of balsamic butter to enrich the flavor. Once the butter is browned, pour it over the squash and toss it to coat all the slices. Add the olive oil and a little drizzle of pumpkin seed oil if you have it. Toss it again, and taste. Does it need anything else? If not, add the mint and pecans, toss one more time, and serve right away. This recipe, adapted from Denis Cotter’s cookbook Wild Garlic, Gooseberries, and Me, is one that I have returned to every fall and winter for many years. Because of the chocolate and the almonds, it has a mole-like richness that I really love. It cooks for a long time, so will help warm up the house and makes for a great Sunday evening dinner when you’re doing things arounf the house. It also keeps really well and scales easily, so it’s a nice one to make in big batches and eat throughout the week. I like it with tortillas or even a quesadilla, but have also enjoyed it with rice. Pickled peppers or onions, chopped cilantro, scallions, and sour cream are all awesome on top. Cut the kale into thick slices, without bothering to remove the stem. Melt the butter (or heat the oil) into an oven-proof casserole dish or cast iron skillet and fry the onion with the chiles over a low to medium heat for 20-30 minutes, until caramelized. Add the garlic and fry for three minutes more. Add the tomatoes and paprika, bring to a boil, reduce the heat and simmer gently for 15 minutes. Add the ground almonds, chocolate, squash, beans, kale, and a teaspoon of salt. Stir until the chocolate has melted. Cover the pan and put it in the oven to cook for 2 hours. This is colorful and delicious and fairly quick to make. Substitute collard greens if you don’t have kale. You can use any miso, but if yours is red or another, darker kind start with a little less and add to taste, as the darker they are the stronger they get. Heat the oil in a heavy skillet over medium-high heat. When hot add the sweet potato dice and several pinches of salt. Cook, without stirring for about 3-4 minutes until you can smell them and they take on some color. Toss and continue cooking until just tender and nicely browned. Remove from pan and set aside. Add kale to the hot pan and another pinch of salt. Cover and cook over medium-high heat for a minute or two to wilt. Stir and cover again and turn heat down to medium and cook for a couple more minutes until softened but not mushy. Add a sprinkle of water if things are too dry. The time it will take to get them just tender will depend on your type of kale. Lacinato takes a bit longer than the Russian types. When tender remove from pan and put in a serving dish and let cool for a few minutes. Meanwhile, stir together the miso, oil, vinegar and chile flakes in a small bowl. Add sweet potatoes to the kale and add cilantro and scallion and finally dressing. Stir well. Taste and adjust seasoning with more vinegar if needed or a squeeze of lime juice to brighten it. Katherine Deumling is a long-time People’s Member-Owner who has created an online Seasonal Recipe Collection that empowers you to cook freely and often, building creativity and confidence with every dish. Cook With What You Have is providing a discounted subscription to the Recipe Collection for People’s Member-Owners and customers for $29/year, or $2.99/month (40% off retail). The site is organized by vegetable/herb/fruit and is centered on flexible, creative templates that allow you to substitute as needed. Use discount code PEOPLES to subscribe at www.cookwithwhatyouhave.com, if you’re interested. This recipe isn’t a secret. 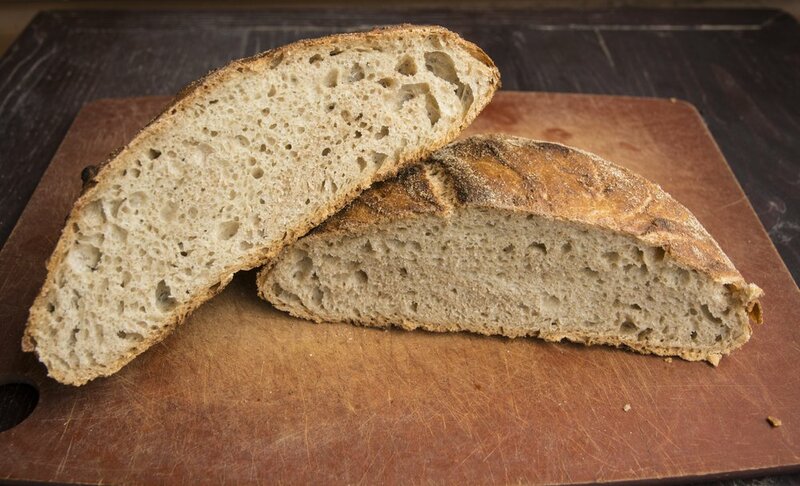 When The New York Times published now famed baker Jim Lahey’s no-knead bread for the first time over ten years ago, it quickly became the most popular recipe that the newspaper ever published. There is good reason for this, which you’ll soon find out if you give this a shot (and, really, there is no reason not to if you haven’t already – unless, you know, you don’t eat bread). This recipe is dead simple. The ingredients are basic and super inexpensive. It doesn’t require any special tools. But the results are really very good: that crispy crust that can be hard to get baking at home, a nice texture the will sop up sauce or soup or olive oil, a decentsized loaf, a gentle tang from plenty of fermentation time. It is also ripe for experimentation. Maybe you want to mix in some different kinds of flours – whole wheat, spelt, rye, some oat. Or add some herbs or spices – rosemary, caraway. Throw in some seeds or nuts, toss in some smashed garlic cloves or olives, mix in some cinnamon and raisins. The bulk section is really your playground, here. We’ll offer two departing places: an all whole-wheat sandwich loaf and the classic recipe (if you want to add in some whole wheat flavor, start with swapping a third of the all purpose flour for another flour of your choice). From there, get experimenting! Recipes adapted very slightly from The New York Times. In a large bowl combine flour, yeast and salt. Add 1 5/8 cups water and stir with your fingers until the dough is combined and there is no more dry flour; it will be shaggy and sticky. Cover the bowl with plastic wrap. Let the dough rest at least 12 hours, preferably about 18, at warm room temperature (around 70°F). The dough is ready when its surface is dotted with bubbles. Lightly flour a work surface and place dough on it; sprinkle it with a little more flour and fold it over on itself once or twice. Cover loosely with plastic wrap and let rest about 15 minutes. Using just enough flour to keep dough from sticking to work surface or to your fingers, gently and quickly shape dough into a ball. Generously coat a cotton towel (not terry cloth) or parchment paper with flour, wheat bran or cornmeal; put dough seam side (where the folds are) down on towel and dust with more flour, bran or cornmeal. Cover with another cotton towel and let rise for about 2 hours. When it is ready, the dough will be more than double in size and will not readily spring back when poked with a finger. At least 30 minutes before the dough is ready, heat your oven to 450°F. Put a 6- to 8-quart heavy covered pot (cast iron, enamel, Pyrex, or ceramic) in the oven as it heats. When dough is ready, carefully remove pot from oven. Slide your hand under the towel and turn the dough over into the pot, seam side up; it may look like a mess, but that is O.K. Shake pan once or twice if dough is unevenly distributed; it will straighten out as it bakes. Cover with lid and bake 30 minutes, then remove the lid and bake another 15 to 30 minutes, until the loaf is beautifully browned. Cool on a rack. Slice into it and enjoy! Combine flours, cornmeal, yeast and salt in a large bowl. Add 1 1/2 cups water and stir until blended; dough will be shaggy. Cover bowl with plastic wrap. Let the dough rest about 4 hours at a warm room temperature, around 70 degrees. Oil a standard loaf pan (8 or 9 inches by 4 inches; nonstick works well). Lightly oil your hands and shape dough into a rough rectangle. Put it in pan, pressing it out to the edges. Brush top with a little more oil. Cover with plastic wrap and let rest 1 hour more. Preheat oven to 350°F. Bake bread about 45 minutes, or until loaf reaches an internal temperature of 210°. Remove the bread from the pan and cool on a rack. Want to mix it up, but don’t know where to start? Variations on this recipe are all over the internet. Give it a Google. Some of my favorite variation guides, of sorts, are from The Kitchn and Green Kitchen Stories. When I made the no-knead bread with 1/3 spelt flour, my dough was super wet and hard to form after 18 hours! I did my best and threw it in the pot, and it turned our pretty great. The results are pictured! You can edit this dish in many ways to fit what you have around and what you like. The basic idea is that you get a salty pot of water boiling, add the pasta and when there is 3-4 minutes left in the pasta’s cooking cycle, add some veggies that will cook also. If you’re adding a frozen veg, defrost it in the colander with a water rinse before adding to the pot. Veggies like broccoli could take longer or be cut smaller, your choice. Veggies such as fresh chard or spinach could be put in with a minute to spare so they don’t overcook. Put a large pot of water on the stove and heat over a high flame. While the water is heating up, wash, trim, and chop the beans. Shell the peas (or take them out of the fridge or freezer). Wash and roughly chop the mint. Once the cooking water is boiling, salt it generously (it should taste salty). Add the pasta and set a timer for about three minutes before the suggested cooking time. Three minutes before the pasta is done, add the beans and peas. Cook for three minutes. Drain well and place back in the pot. Add the olive oil (important to keep the pasta from sticking! ), lemon zest, drained capers and a few pinches of sea salt. Season to taste. Fold in the fresh mint and serve. Originally this was a recipe for roasted beets and farro, which I found on the illustrious FoodNetwork.com. I don’t find farro to be that interesting of a grain, so this is the jazzed up version. It takes a little longer to prepare, but I find that it’s more interesting. You can leave out the cheese entirely and it’s still delish. Cut beets into halves. Combine the beets, olive oil, 1 teaspoon of salt, some pepper, the thyme sprigs, and the garlic cloves on a baking sheet. Cover with foil and roast for 30 to 35 minutes, until easily pierced with a paring knife. During that time on another rack in the oven, roast the pistachios for 5 minutes. Set aside both to cool completely. Melt the butter in a medium saucepan or deep saute pan over medium heat. Add the buckwheat and stir until coated with butter and fragrant, about 2 minutes. Stir in the prunes and add 3 cups of stock. Bring to a boil, cover, and let simmer on low for 25 minutes. With a paper towel, remove the skins from the beets. Quarter the beets and add them to the bowl with the cooked buckwheat. Fold in the toasted pistachios. Squeeze the roasted garlic into a small bowl. Mash it with a fork and season with salt and pepper, and then stir it into the salad. Pour the dressing over the salad and toss gently to combine. Top with the crumbled goat cheese. When I was in my late teens and early twenties I would sometimes go into The City (you know, New York) for a weekend with friends. I had very little money, but what money I had I hoarded and then spent exclusively on restaurant food. I would walk all over and eat samosas in a basement level quicky mart with cab drivers on the lower east side, and then oysters at the cavernous Oyster Bar in Grand Central Station. One place that was frequently on the list to visit was Angelica’s Kitchen – one of the first hip vegetarian restaurants ever. Gluten Free Corn Bread – they had it before it was cool. This potato leek soup is like a free trip to that restaurant. It’s familiar and comforting but somehow also bright and healthy. It comes out a lovely green once it’s pureed. The only next level cooking tool you might need is an immersion blender – you could use a regular food processor but it would take a lot of ladling hot soup back and forth – not my favorite way to pass the time. Combine the ¼ cup oil, leeks and whole garlic cloves in a heavybottomed pot or deep sauce pan over medium heat. Cover and simmer for 3 minutes. Add pinch of salt, lower the heat, cover and cook 15 minutes longer, stirring occasionally. Add the potatoes and enough stock to cover them, and bring to a boil. Reduce to a simmer and cook until potatoes are tender, about 20 to 25 minutes. Add the spinach or watercress to the soup and simmer for 1 to 2 minutes longer. Add tarragon and remaining olive oil, and then blend the soup until creamy with an immersion blender, or in a blender or food processor. Stir in lemon juice, season with salt and pepper to taste. If the soup is too thick, thin with additional stock to desired consistency. A quick supper for an autumn weeknight, celebrating some staples of the Northwest. Slice the cremini mushrooms. Put butter and a small drizzle of oil in a cast iron pan, raise the heat to high and add the mushrooms. Stir to coat, reduce the heat to medium and cook without crowding until they start to color on one side. Flip them with a spatula and cook until colored on the other side. Towards the end, turn the heat back up to high and press down on them with your spatula. The remaining water should sputter out and evaporate, and the edges should crisp just perfectly. Swiftly remove and set aside. Cook the polenta in a heavy-bottomed saucepan: mix the polenta with 4 cups of water, 1 teaspoon salt and olive oil, bring to a boil, reduce to a simmer, stir. When it first starts to really thicken, add the cremini mushrooms and a knob of butter. When it starts to thicken dramatically, reduce the heat to as low as it’ll go and stir in another pat of butter. De-stem the kale leaves and cut them into ribbons. Stir them in, cover the pot and turn off the heat. Let the polenta rest so that the kale can steam. In the mushroom pan, add more butter and oil. Cook the fancier mushrooms in pulled-apart pieces on medium-high heat. Add a drop of mustard, maybe a splash of beer or wine if you are drinking any. Add some salt and a heavy cracking of black pepper. Serve the polenta with kale ribbons in a bowl, topped with the fancier mushrooms and a dusting of flaky salt. This kind of dinner can also be made with delicious polenta triangles. This is an adaptation of “Erico’s Easy Polenta,” on the back of the Golden Pheasant bag. Butter a ceramic baking dish. Pour in the water. Stir in the salt to dissolve it. Add the polenta and olive oil, stirring to distribute the oil and avoid clumping. Bake at 350 degrees F, uncovered, for 50 minutes. Run a fork through it, spread melted butter over the top with a rubber spatula, and bake for 10 more minutes. Let cool, then cut into triangles. Fry up in oil, and top with mushrooms and kale or other delicious things. Roasted squash, roasted garlic, roasted cauliflower? Chickpea curry? Ratatouille? Prepare a big bowl with cold water. Drop in some lemon juice from a bottle or a fruit. Peel the celeriac. Drop into the lemon bath immediately. Trim the fennel (reserving the tops with fronds) and slice into thin boomerangs. Move them to the lemon bath. Take out the celeriac, cut it in half, put the other half back. Keep cutting the celeriac now into thin-to-medium matchsticks. Moving the finished ones to the lemon bath, then repeating with the second half of the vegetable. Cut the oranges into 1/4 inch rounds. Trim the peels with a paring knife. Cut little triangular pieces, removing center seeds or any remaining pith, so you have clean and beautiful jewels of citrus. Drain the lemon bath, add more lemon juice, a splash of tarragon white wine vinegar, and olive oil. Toss to dress. Chop the handful of almonds roughly, just making sure some pieces are quite small. Assemble each serving separately. Take the celeriac and fennel pieces, make a nice pile, add pieces of orange, toss over some almonds, drizzle over some good finishing-olive oil, crack on black pepper, toss on some finishing salt, then tear fennel fronds over the whole thing. Recipe courtesy of Andrew Barton, photo credits Peter Schweitzer.